Here is a list of Aquarium exhibits that have live webcams at various locations around the world. This is where you will find LARGE aquariums containing Sharks, Dolphins, Killer Whales, Sea Turtles and other saltwater and freshwater creatures like that. If you’re looking for smaller aquariums such as goldfish, please see our Home Aquarium category. The Monterey Bay Aquarium is one of the best in the world, and is located in Monterey, California. See the Kelp Forest, Sea Otters, Sharks, Penguins, Birds, Monterey Bay and more. They also have a Great White Shark at the aquarium, so you may also be able to see it. You can watch live feedings of the animals. Watch the Monterey Bay Aquarium Webcams. The Dallas World Aquarium has two webcams. Watch manatees and a deep water ocean cam where you can see giant Japanese spider crabs and other strange sea creatures. Visit the DWA Webcams. The National Zoo is home to the Amazon River Cam where you can see various freshwater fish native to the Amazon. It has streaming video and some of the fish you see include giant arapaima, pacu, red-tailed catfish, piranhas and more. Watch the Amazon River Cam. The Sunshine Aquarium is located in Japan and allows you to see Seals being fed, watch Penguins and also see the underwater Kumanomi coral reef cam. Streaming video. Watch the Sunshine Aquarium Webcams. 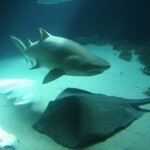 The Waikiki Aquarium has a nice animal cam where you can see Black Tipped Sharks as well as Jacks, Rays, Snappers and Groupers. The sharks are fed three days a week – on Tuesdays, Thursdays and Saturdays, so check back often and perhaps you’ll see a feeding frenzy! The web cam image updates approximately every three seconds. Watch the Waikiki Aquarium Webcam. Here is a live aquarium cam located somewhere in Japan that shows a very wide variety of sea life including sharks, rays and who knows how many types of fish. This is a remote control aquarium cam but seems to have limited control, so you may only be able to move it a little. Since this is in Japan, this may be dark after about noon in the U.S., so if it is, check back late at night to watch or early in the morning. Watch the Aquarium Cam in Japan. 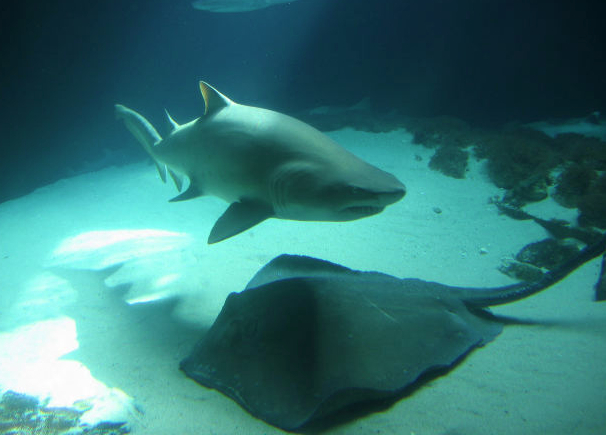 The New England Aquarium is located in Boston, Massachusetts and features two live webcams. One that lets you watch Penguins swim underwater and the Giant Ocean Tank cam allows you to see Sharks, Rays and many other sea creatures. Watch the New England Aquarium Webcams. Catch a rare glimpse of Beluga Whales on this web cam coming from the Vancouver Aquarium. The aquarium is home to five Beluga Whales. They can perform tricks and even turn their heads and alter their facial expressions! You can also watch Sea Otters on a separate cam you can find on this site. This live video feed is available during Vancouver daylight hours. If it is dark, that is simply because it is currently dark in Vancouver. You can view this video directly from your browser. Watch the webcams at Vancouver Aquarium.